Using a competency-based approach has been proven to result in more efficient and effective learning and development processes, reduced costs and more productive, successful and engaged employees. They are defined in terms of observable behaviors, and therefore can be assessed or measured. Job Competency Profiles or models provide a comprehensive set of standards against which employees can be assessed. These standards can include not only the hard skill requirements like education and technical / professional competencies, but also the harder to measure attributes that are so important for success on the job, like the ability to operate effectively in a team environment, initiative, concern for client / customers, results achievement, etc. Using a competency-based approach allows the organization and employee to determine the inventory of competencies the employee possesses. 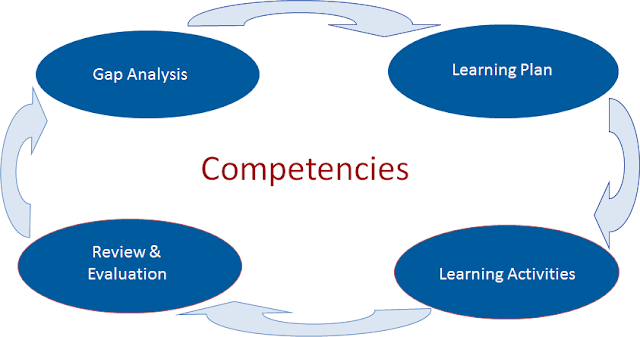 Comparing the employee inventory of competencies against the competencies required in a job allows for a determination of the level of fit between the employee’s competencies and those required for a job or set of jobs. Gaps between what is required as compared with what is needed in the job then allows for the identification of a learning and development plan best suited to the employee’s needs. This process is described in more detail through the Learning Cycle. Whether at the individual or organizational level, learning follows the cycle shown in the diagram below. Gaps in the learning are determined, which leads to the development of plans for addressing the gaps, followed by implementation and then review and evaluation to determine whether learning has occurred and the gaps that have to be addressed in the next cycle. At the individual level, employees can assess their competencies against those required for their own job, or for another job in which they are interested, and then take steps to acquire or improve any necessary competencies. If they do this in conjunction with their supervisors, more formalized individual learning plans can be created based on the employee’s strengths and areas for development. The plans can be implemented and progress tracked. At the organizational level, the competencies provide the foundation for assessing the gaps between the desired skill levels required in the organization to achieve the organizational vision, mission and mandate and those currently existing among the employee population. This gap analysis information is rolled up principally from gap information gathered at the individual employee level. Based on key trends in this gap analysis, decisions can be made about investments in learning and progress in closing organizational gaps in learning can be tracked. The next two blogs will address the learning cycle at the individual and organizational levels in more detail. The competency profile for the job is a critical tool in competency-based learning and development, as it details the critical competencies essential to achieving success in a given job. You want to avoid drawing a “general” picture of the job based on only experience and education. Why? Because the individuals with the most experience or education are not necessarily the best performers. Using competencies is the only way that you will have an objective means of measuring skill and understanding precisely where the shortcomings are. The next blog in this series examines the learning cycle at the individual level. Sign up to our blog’s mailing list through the form on the right-hand side to receive the rest of the series in your inbox. Thank You for the summary provided .I got the knowledgeable information.